Polly & Meek - What does God intends for sisters? The best of everything of course! Read about the ups and downs most siblings share. Whether young or old there is just something special about sisters. What does God intends for sisters? The best of everything of course! Read about the ups and downs most siblings share. Whether young or old there is just something special about sisters. “This is a sweet treasure that pays homage to sisterhood...To sisters everywhere...you are a gift from heaven. “Tamika has done an exquisite job of turning everyday moments into lifetime treasures that anyone can enjoy. Onjeinika’s simple yet elegant writing style delights me and my young children and has provided countless hours of enjoyment. 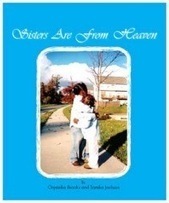 “Sisters Are From Heaven” shows what can happen when we wisely invest our time and talents to the glory of our Creator. Polly & Meek is devoted to spreading words of inspiration to adults and children by reinforcing important childhood lessons and edifying families; just as God intended. We are committed to promoting early literacy. Our children’s picture book teaches siblings to love each other and share that love with everyone. Our educational materials are designed to prepare your pre-schooler and help them excel academically. We do all this to the glory of God!